Rather than go for the standard suit that you have always been seen wearing on any event, why not spice up your looks by looking sharp on that next formal occasion that you are planning to attend? Three-piece suits are back in the fashion scene in a very big way. They are effortlessly contemporary and stylish and are often preferred on business, proms, weddings and many other events. As a matter of fact, it’s the best choice by far for any formal occasion. The modern designs may also be worn on casual night events, enabling you to stand out from the rest of the crowd at any social events with your mystifying look. The use of three-piece suits can be well complemented by using a slim fit shirt and a pair of cufflinks. Three-piece suits also complement individuals who are stylish and adventurous with their fashion statement. With different colors, styles and shapes to choose from, finding one that will perfectly represent your personality will not be difficult at all. These types of suits perfectly combine together a classic and modern touch of fashion, thus creating a fusion that is perfect for any modern man. There are many good reasons to wear a three-piece suit. They offer that great, classic look and are always on trend. Plus, a good three-piece makes a man feel good about himself. Any guy can slip into a two-piece suit. But adding that third component, the vest, (aka waistcoat) somehow makes the perfect finish to an elegant and stylish look. That is if you get the fit and the color just right. Of course, your vest needs to fit well. When worn over a slim-fit shirt it becomes an integral part of the trio. And the popular misconception that adding a vest makes you look fat is simply not true. A vest holds everything in place. It adds structure to your outfit. 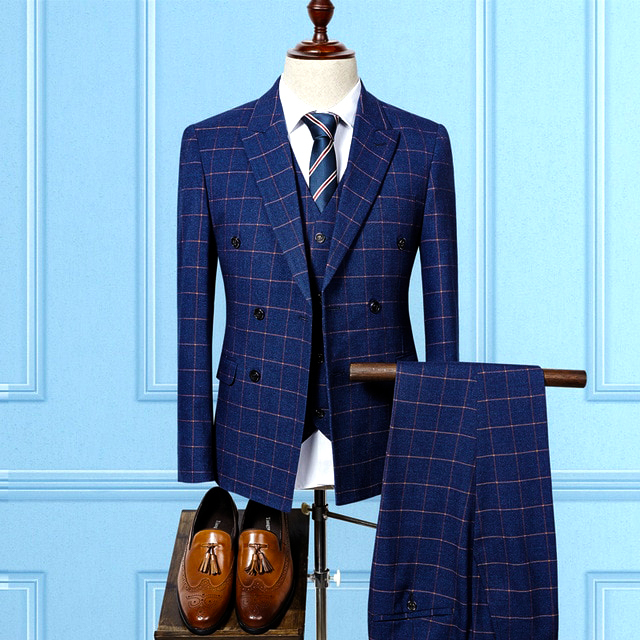 Nobody can deny that a three-piece suit creates a more ‘put together’ look than a regular two-piece. Even with your jacket buttons undone, a vest will give you a neat and finished look. In fact, the result is a very appealing look indeed. Another big advantage is that owning a few three-piece suits gives you a lot of options. You can opt to wear the vest on its own with an open neck long sleeved shirt and well-fitted jeans. Or you can mix the waistcoat with the jacket and pants from another coordinating suit. Of course, if you want to be a little less formal, you can leave out the waistcoat altogether and simply wear the suit as a two-piece. Any event where a suit is called for you can choose whether to wear either a single or a double-breasted jacket. But only wear a double-breasted jacket as part of a suit, and never as a blazer. 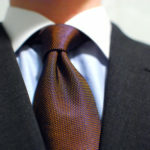 Double-breasted is more formal than a straightforward single and should always be worn with the proper trousers. Plus, they can’t be dressed down as a single-breasted jacket can. A single-breasted jacket, on the other hand, can be worn with casual pants, such as fitted jeans or chinos, with or without the vest. A lot of younger men are unfamiliar with double-breasted three-piece suits because they can be difficult to find. Single breasted three-piece suits, on the other hand, are worn around 90% of the time and are more widely available. Singles can come with anywhere from one to five buttons. Double-breasted suits have an extra fold of fabric across the front, and they also have a second row of buttons. They will usually have a total of four buttons or six, which is the classic style. Here’s an extra tip. Make sure the buttons are in a Y shape as opposed a V. This is considered to be much more stylish, and it will fit better too. If you are going to wear a double-breasted suit, it’s vital your jacket is a perfect fit. They are not as forgiving as a single-breasted, and the buttons need to come together. Also, make sure that everything lies flat, with absolutely no puckering. Let’s begin with the vest. This may appear straightforward, but it can be quite tricky to find the right fit. Remember you won’t always be wearing your jacket, so the vest has to look good over your shirt too. There are distinct pointers that can help you find the perfect size. The front hem, for example, should be long enough to conceal the pants’ waistband. 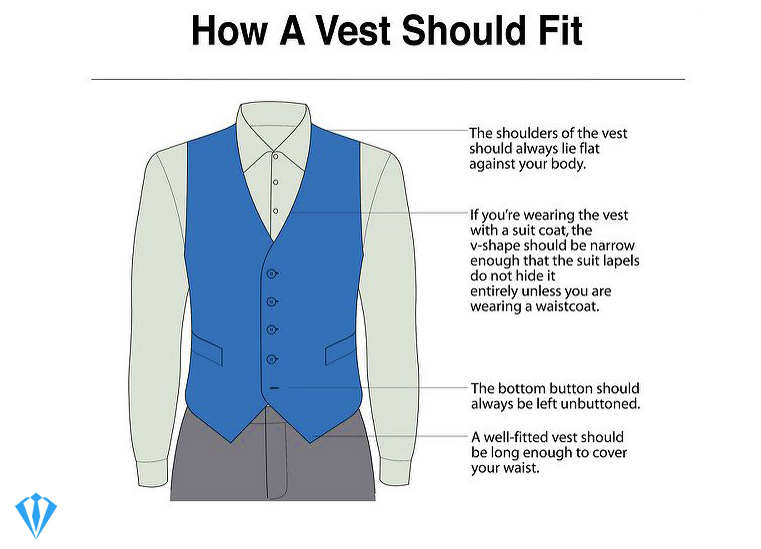 When the jacket is fastened, an inch or so of the top part of the vest must remain visible. Also, the V of the waistcoat should not obscure the edges of your shirt collar. Lastly, you want your vest to be narrow at the waist. The sides, however, are just right when they fall straight down. To get the right fit for your jacket, first, make sure the shoulder pads end where your shoulders do. Nothing looks phonier than shoulder pads that extend too far. Next, look at the buttons. If there are two, the top one shouldn’t be lower than your navel. If you have three, then the same applies to the middle button. To check the jacket length, stand with your arms at your sides. Your hands need to be where the hem of the jacket ends. The sleeves should reach down to where your thumb and wrist join. As a final check, the cuff of your shirtsleeve should stick out by about half an inch. The best fit for the trousers of a three-piece suit is high on the natural waist. That said, younger men might prefer a slimmer fit with a lower waist. It’s best not to wear a belt with a three-piece as it can cause the vest to bulge. Use suspenders instead, or if you can, nothing at all. Trouser length is very much a matter of personal preference. Shorter guys might prefer the pants’ hem to barely brush the top of their shoes. Taller men often go for the full break. Both are allowed. 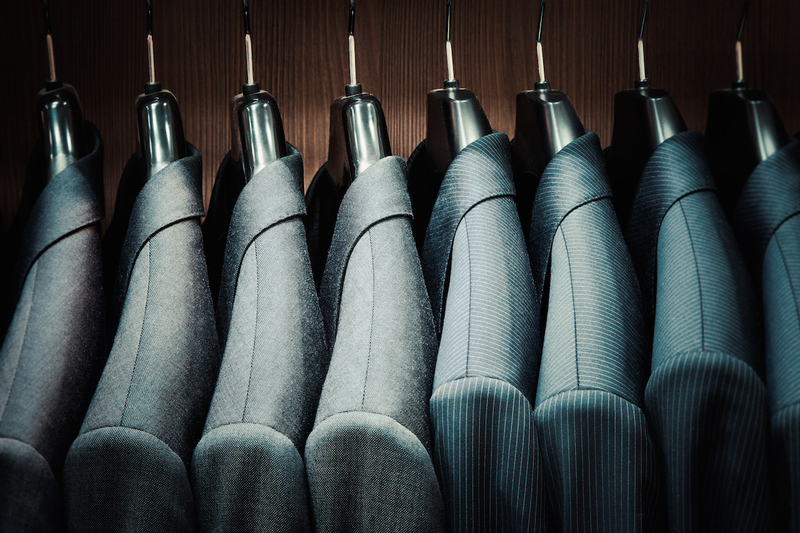 To learn more how to fit your suit, read our complete men suits guide. 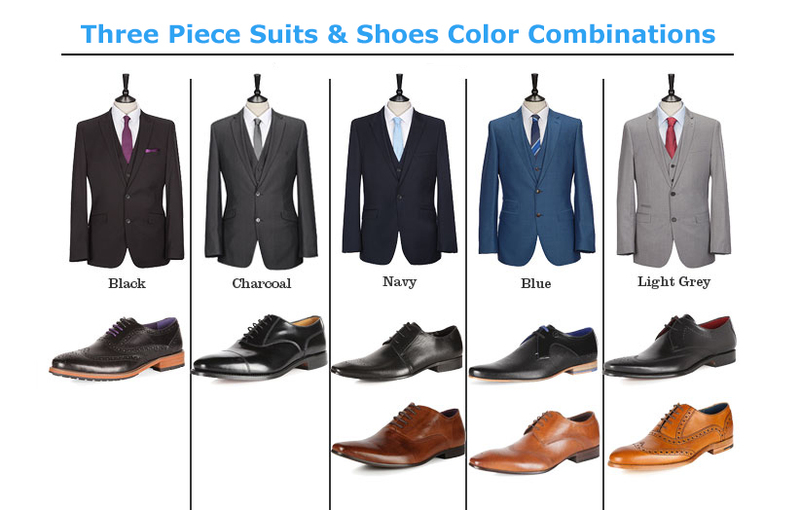 Starting from the bottom up: your shoes should match the tone of your 3-piece suit. Brown shoes go nicely with blue or navy. We always advise black shoes with a black suit, but black shoes work well with grey or charcoal suits too. Moving up: for a more formal look, the jacket, vest, and trousers should all be the same color. But wear a coordinating or contrasting vest for a less formal look. Regarding shirts: white shirts are a staple and go with most suits. They give a crisp, clean look. You can wear almost any color tie with them too. Pale blue is also a good shade for a dress shirt and provides a classic alternative to white. Pale blue goes with most people’s skin tone and hair color. Add a navy tie with grey, tan or navy suits. A three-piece suit isn’t something you’re going to put on every day just to go to the mall. But don’t keep it at the back of your closet purely for formal occasions, either. Weddings are a great place to wear a three-piece. It’s a celebration after all, and nobody is going to laugh if you dress up. We encourage you to experiment with different color and pattern combinations. The main thing is to avoid dressing like you’re headed into the office. Navy blue, or even a lighter blue, fits right in at weddings and you really don’t want to wear anything too dark or somber. If you have an office job, chances are a three-piece suit won’t look too over-the-top. Stay away from bold colors and accessories though, and stick with classic shades of navy, grey, and black. Other places to wear your suit would be a day at the races, an evening at the opera, to the theatre, or a formal dinner. The complete package includes a vest, jacket and pants. It comes with a single-breasted jacket with one-button closure and 4 detail button on its cuff. In addition, the interior is French facing and fully lined with single back vents, 2 flap pockets and a welt chest pocket. What most users love about this suit is that the material is very comfortable and lightweight, perfect for any event. This set features a vested regular fit men’s suit. It includes a single-breasted, two button, and a dual side vent jacket and flat front pants. Besides being a classic suit, it also comes with a modernly fitted cut and looks. In addition, other features include a flap pocket and 5-button matching colored vest that comes with three outside pockets with an adjustable back. This three-piece suit is certainly perfect for an all year round use, making it a great investment added right into your closet. Available in black color, this suit is made of high-quality fabric wool touch. It means that dry cleaning is its recommended maintenance option. The set features two buttons, three-piece notch lapel suit, with flat front pants and side vents jacket. The pants come in a flat front style and are free length, which means that they are not hemmed for you to make sure that fit is appropriate to your needs. A suit made in quite extraordinary and elegant design. Perfect for any formal event, or any occasion which requires formal looking attire and appearance. This set is constructed using 60% Viscose and 40% Polyester. As such, recommended maintenance is only dry cleaning. It comes in a slim fit, three-piece tailored suit. What most users love about this suit is the fact that it is classy enough to make you a standout in any event. Like a three-piece suit, you can enjoy its classic appeal, combined with a modern touch. This suit from Alain Dupetit is composed of 65% Tetron and 35% Rayon, making it very breathable, comfortable, smoother, softer, and very easy to wash compared to other suits that are made of pure wool or cotton. Available in many colors, it really satisfies most of the customers. In fact, more than 75% of the people who purchased this suit, rated it as perfect. Besides, the price is really cheap when it comes it a suit of that quality. The material is made up of 65% polyester and 35% cotton. As such, this suit is only recommended for dry cleaning only, and not safe for machine or hand wash. According to certain reviews of the product, the suit is just awesome for this money. It comes with very good quality and good design. Looking perfectly for any occasion. 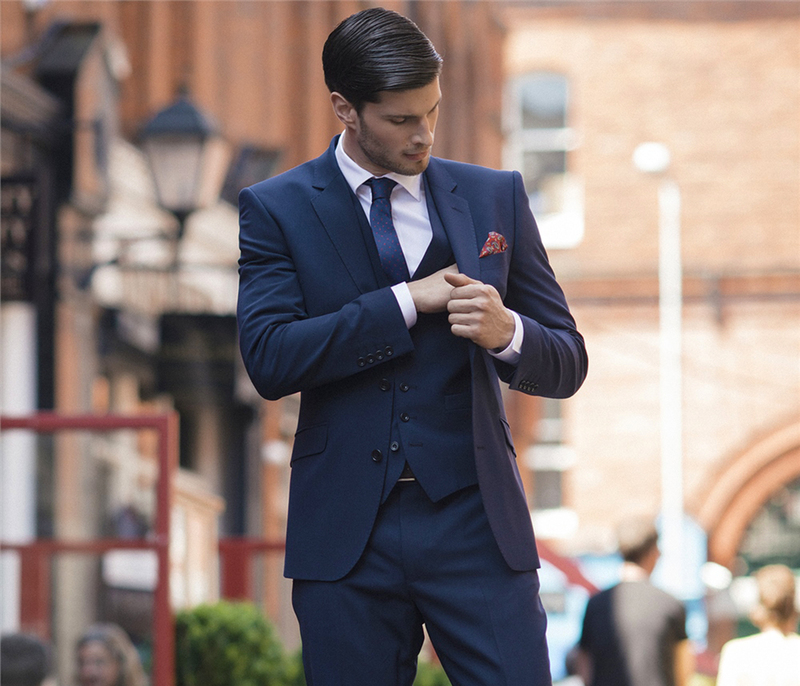 These days, three-piece suits have been introduced as a fusion of modern and classic look. They served as an essential part of the executive wardrobe back in the 1930s. However, three-piece suits have visited the modern fashion scene again. This style has become the favorite among those in the corporate business climate. 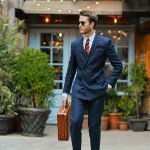 The only difference is, as reviewed in the list of options above, the modern three-piece suits have become more structured and slim. Each and every item on the list above comes with its own set of features. Your choice highly depends on your personal taste and preference. Poshawn’s Slim Fit Three-Piece Suits come with features that can provide you with that corporate look you need. Besides, you can enjoy a good sense of fashion at the same time. 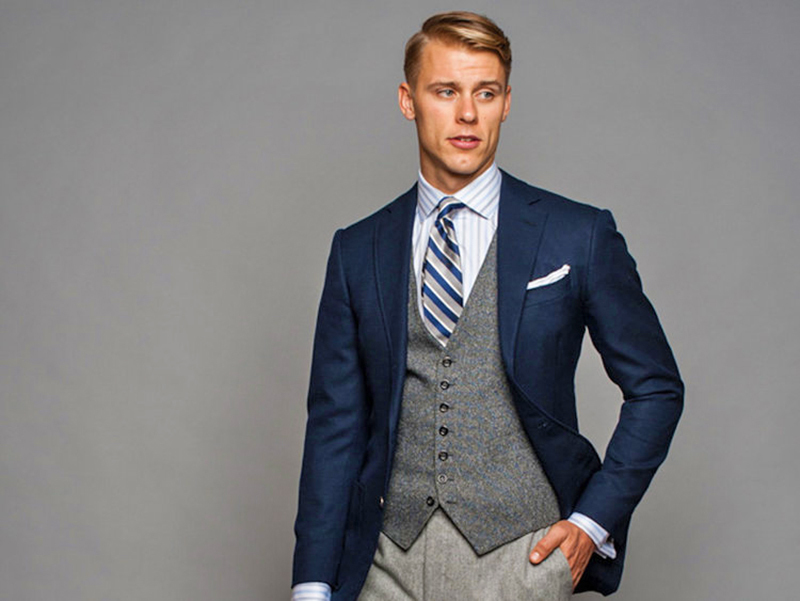 However, our choice belongs to the three-piece vested suit by Salvatore Exte. The classic fit suit is available in multiple colors and belongs in the top 10 suits on Amazon’s listings. It’s perfect business attire, representing power and determination. Besides, it’s really cheap and affordable, totally worth the price.